NEXCOM now provides highly scalable NVR security surveillance systems, as intelligent digital security is more and more in demands of multiple connections among devices for collaboration. With 3 high resolution display output, which allows both clone and extension modes, NViS 6308 is convenient for our users to share the images for various purposes, such as single display for large audience within a commend center, or multiple-screen synchronization for displays facing different directions or mobile devices. VMS specifications are also compatible. NViS 6308 is driven by Intel® Core™-i processors of Kaby Lake series with its GT3 HD GPU processor that supports 4K resolution, in addition to HEVCH.256/H.264 decoder and encoders support. Moreover, 2U rackmount video server is equipped, which also provides high storage capacity up to 80T for video streaming recording along with the optional M.2 SSD if considering of master storage for OS implementation. Users can be in the comfort of such full-scale specifications supporting video output and recording functions. 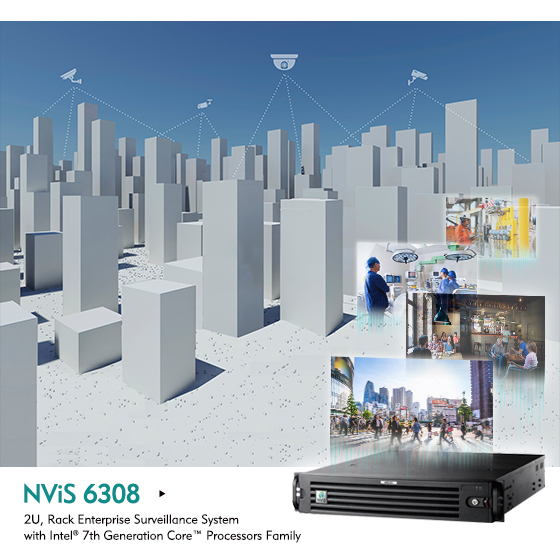 NViS 6308 is particularly recommended for surveillance with high video storage capacity requirement. PCIe expansion is another highlight. NViS 6308 can be interfaced with as many as 3 other devices through its built-in style PCIe, such as capture card, graphic card, CNA card or RAID card for data backup.